Getting kids into the right equipment and clothes is one of the most important aspects to making skiing fun for kids. We’ll look at how to find the right gear for your kids and review whatever we can get our hands on. For about a year my four-year-old son has been wearing a pair of mittens that have been driving me absolutely crazy. I’m not sure what brand they are, but they feature a zipper on the side of each glove, which makes it easy to fit a young child’s hand into the mitten, zip them up and then stuff the cuff of the glove under the kids jacket to keep out the snow. At first this seemed like a great design to me, as it avoided the painful struggle required to get little fingers into the right holes. However, because the mittens are very stiff, and my son’s fingers were rarely in the right part of the mitten, he pulled them off every time he wanted to do anything. At the beginning of our last ski trip to Squaw Valley I stopped by the fantastic Granite Chief Ski Shop in Truckee and upgraded his gloves to a pair of Dakine Tracker Gloves in size KS (kids small), which are recommended for 4-6 year olds. The gloves look and feel just like an adult pair of gloves, and fit his small hands incredibly well. He was able to easily get his fingers into the finger holes, and the elastic cinch draw string made it possible to tighten the gloves at the bottom, keeping any stray snow out. Most importantly, the gloves were flexible enough for him to easily pick things up, so he wasn’t taking them off every time he needed to grab something. The gloves, which retail for $30, use Dakine’s own “DK Dry” waterproofing technology, which performed well over the course of the week. 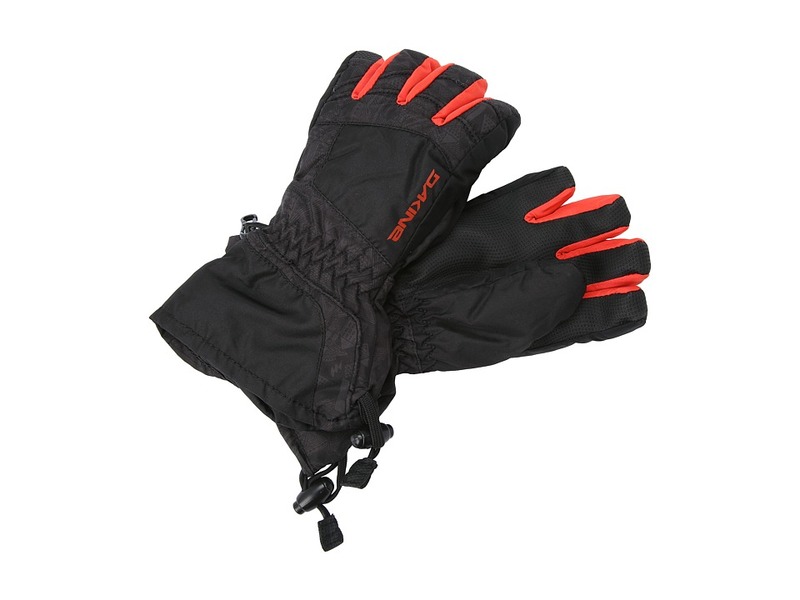 For $10 more, you can upgrade to Dakine’s Avenger Glove, which has a Goretex, and should be more breathable if your child has hands that get hot easily. The Dakine kids glove website has a sizing chart as well to help figure out what size fits best.